Join our dedicated website for Hurricane Michael relief efforts by clicking here or visiting www.flworkersfund.org to donate, request relief assistance, and sign up to volunteer. As residents of the Florida Panhandle and Big Bend continue the immediate work of digging out after Hurricane Michael by dealing with the loss of electricity, needing food, water and basic necessities, the Florida AFL-CIO is working to help provide assistance for both the short and long term for the victims of this terrible storm. 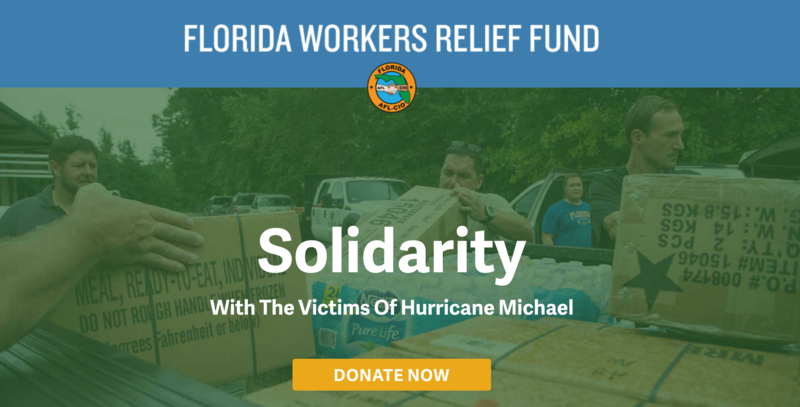 The Florida AFL-CIO has established the Florida Workers Relief Fund in order to provide direct support to union members, community allies, their families, and neighbors. The funds we raise will be used to help purchase the essential items and services desperately needed by working families impacted by Hurricane Michael across the state. Each dollar we raise will go directly to families in need, with no overhead or administrative costs. 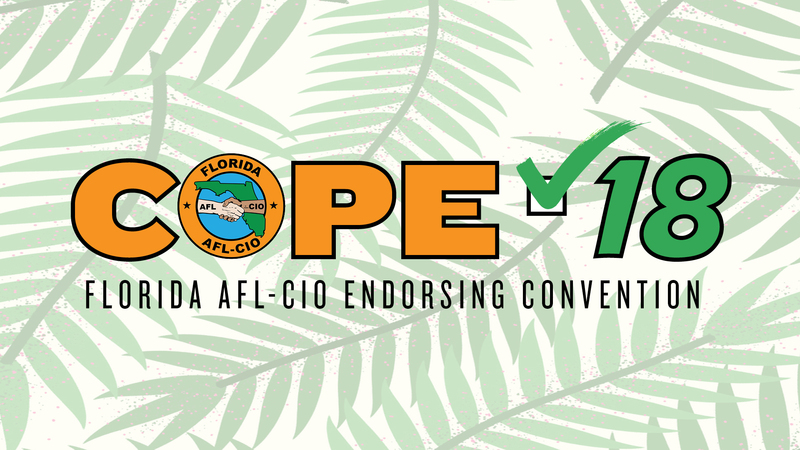 The Florida AFL-CIO is tapping our greatest resource, our members, to create a network of workers across the state who are identifying those in need and providing them the support necessary so that they can get back on their feet. This is an excellent opportunity for your generosity to make a real difference, supporting a program of workers helping workers to help make our communities whole. We want to thank the over 300 delegates and guests who made their voices heard at to the 2018 COPE Endorsing Convention! 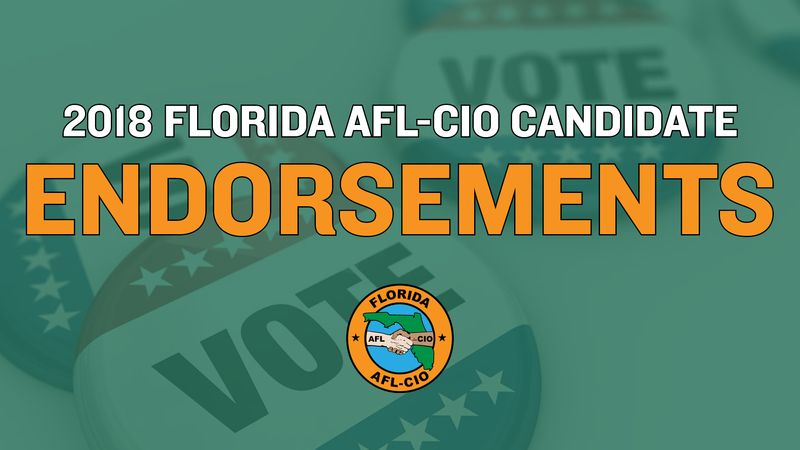 Click here to view the 2018 Florida AFL-CIO union endorsed candidate list. Click here for our 2018 Amendment Guide. See below for pass/fail overview of the major working family issues we followed during the 2018 Legislative Session. Click here for a downloadable version of the brief. Stay tuned this weekend to our Facebook and Youtube pages for your union legislative update video finale, “Sine Die” edition. 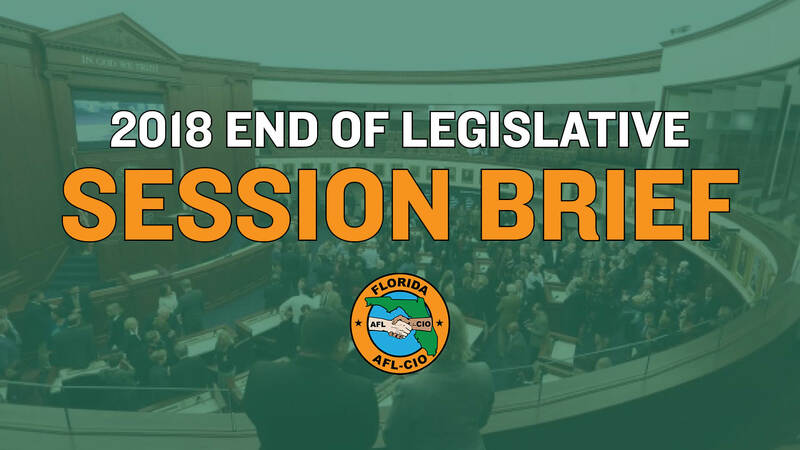 UPDATE 6:30PM: In a prime example of how HB 7055 was rushed through the process, after passing the Senate earlier this afternoon the Florida House completed the final passage of this bill this evening. The bill now goes to Governor Scott’s desk to be signed into law. As we have seen over the last week with the teachers strike in West Virginia, there is power in numbers. HB 7055 is another attempt to chip away at that collective power. 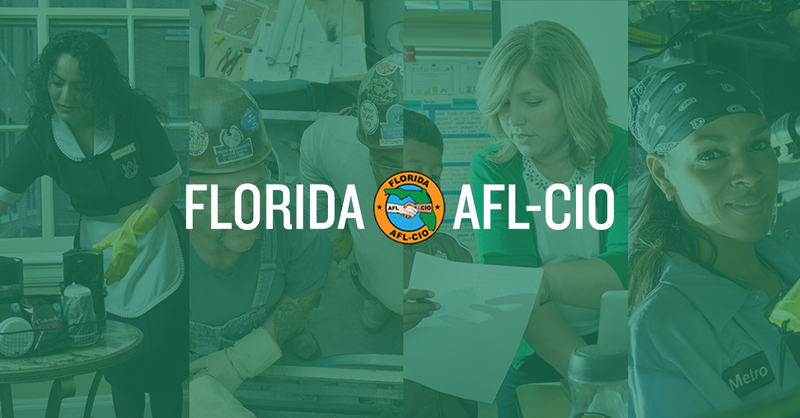 The Florida AFL-CIO has and will always fight for the rights of workers to have a voice in their workplace. There’s a reason why corporate special interests and the legislators they own constantly try to undermine unions. That’s because they know that the last line of defense in protecting our most fundamental democratic institutions like public education, workplace safety, and good jobs with fair wages is a united and organized work force. Today was a sad day in Florida. Today’s vote pours salt in the wound of last year’s HB 7069 battle but we are confident that the people are waking up to this threat to our most cherished institution and are ready to escalate the fight. Thank you to the thousands that called, emailed, and visited your legislators over the last nine weeks of legislative session. Your voices were heard, but our legislators still voted against public education and our teachers, and for wealthy school privatization interests in our state. UPDATE 5:00PM EST: The people of Florida learned a cruel truth today about the Florida Legislature. They learned that the corrupt forces of school privatization are controlling both chambers of the legislature and members of both parties. They also learned that those looking to profit by destroying education will do anything, especially destroying one of the most effective forces against them, our teachers and their unions. HB 7055 will shift millions, eventually billions of tax payer dollars from traditional public schools to for-profit interests including private schools and charter schools and silence the teachers and their union who stand in opposition. Four brave Republicans, Senators Hukill, Grimsley, Lee and Young, stood up to these forces and stood strong with public education. That would have been enough. Unfortunately one Democrat stood with school privatization. Senator Bill Montford voted for the bill. If he would have stood with our public schools and honored the principles of their party, this travesty would not have happened. Since the bill was amended in the Senate, HB 7055 now goes back to the House for final passage before it goes to Governor Scott to be signed into law. Before the House attempts to pass this bill again, make sure they hear from you. Use Florida Education Association (FEA) online tool to be connected with your local House member NOW! Heroes! Start off your penultimate legislative update in action by dialing (855) 235-2469 and telling your Senator to vote NO on HB 7055 that is up for a final vote this Monday. 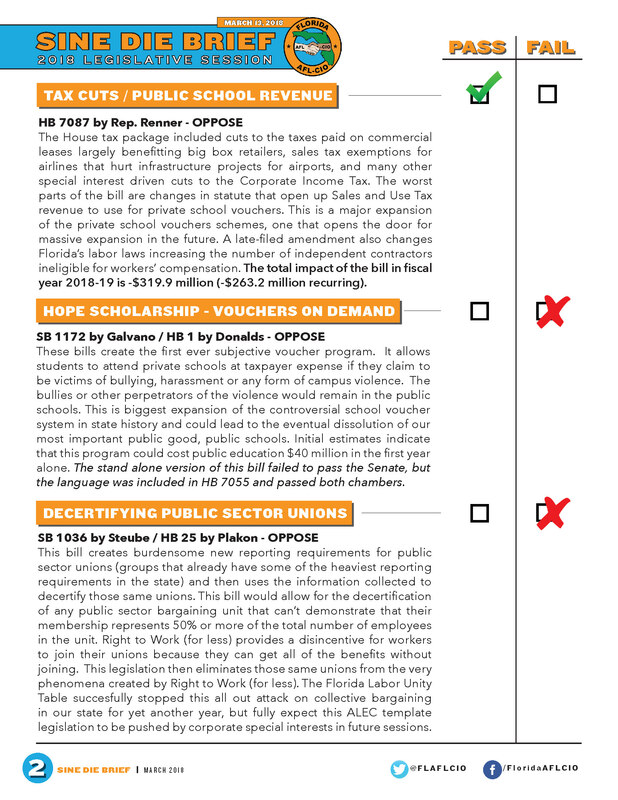 In this update we cover how our villainous Speaker of the Florida House has completely hijacked the legislative process by forcing his hand to push the Senate to pass HB 7001, legislation that would make it almost impossible to close corporate tax loopholes and HB 7055, legislation that would siphon millions of taxpayer dollars to for profit schools and decertify teachers unions. Heroes! Get dangerously informed with our recap for week seven of the 2018 Legislative Session. In our newest update we cover the continued attack on public education, legislators scrambling to protect corporate tax loopholes, students from Parkland to Tallahassee descending on the old Florida Capitol in protest and much more. After the update, take action by dialing 855-235-2469 to tell your Florida Senator to vote NO on HB 7055. Heroes! 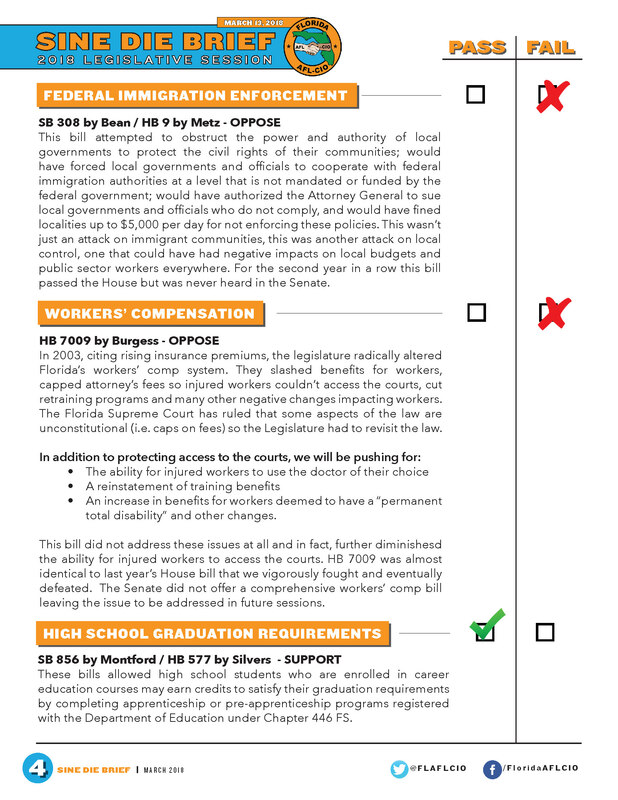 Fly into action with our union update for week six of Florida’s Legislative Session. In this episode we cover yet another attempt to dismantle public education in the Florida House, the Senate bill that would ban fracking, and union members from across the state storming the halls of the Capitol. 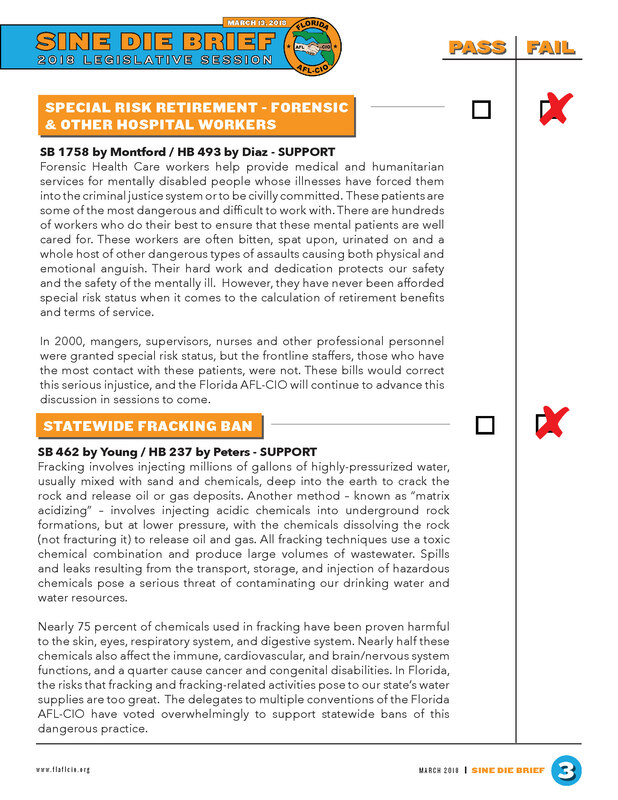 After the update, pick up the phone and call 855-235-2469 to tell your Florida Senator to vote NO on HB 7055. This bill is a disaster for our states students, teachers and public schools, and this our chance to stop it. Heroes! Special interest villains abound in our update for week five of Florida’s Legislative Session. Watch as we cover working families taking to the halls of the capitol in opposition to the massive education “train” bill HB 7055, the Constitution Revision Commissions “Terrible 10” anti-worker proposals, and legislation that would ban fracking in Florida. Heroes! Union-busting villains are back in our week four legislative update. In this update we, cover legislators restricting revenue for public programs, the HB 1 “Bully Bill,” anti-immigrant legislation, and HB 7055 the massive new attack to defund public education and bust up teachers’ unions. Call 855.235.2469 and enter your zip code NOW to be connected with your local Florida Representative. Leave them with the message that they need to stand up for our public schools, our students, and our teachers by voting NO on HB 7055. 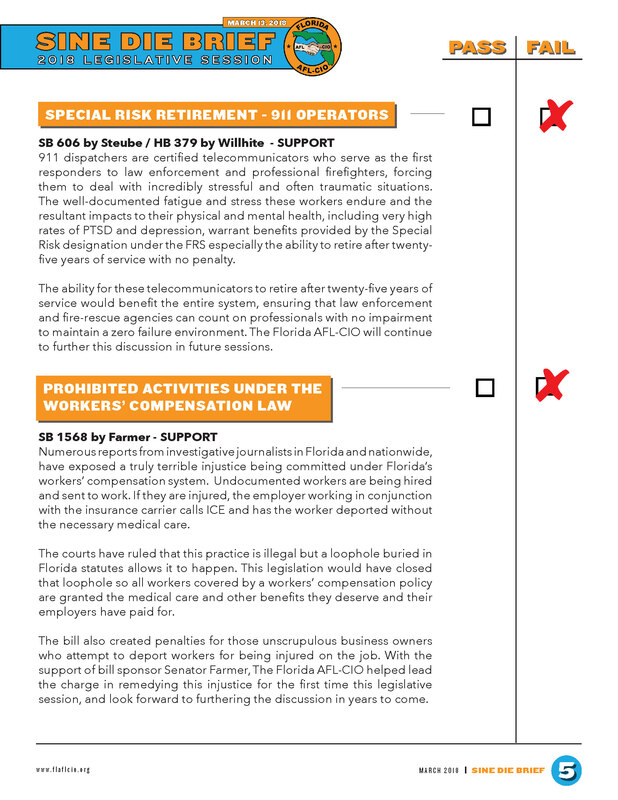 Sign up to receive action alerts from the Florida AFL-CIO.